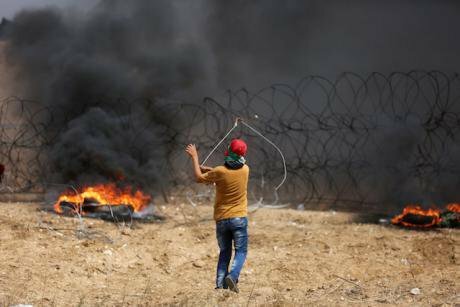 Palestinian boy protesting near the border with Israel, in eastern Gaza City, 27 April 2018. Picture by Momen Faiz/NurPhoto/Sipa US/PA Images. All rights reserved. This year marks the 70th anniversary of the Nakba, the process of ethnic cleansing carried out by Zionist militias in Palestine which led to the displacement and dispossession of more than 750 000 Palestinians, including my own family. I will not only confine my deliberations to abstract concepts and theories, but will evoke the reality as we experience and understand it on the ground in Gaza and in the diaspora. We Palestinians are fully aware of the fact that we are the victims of an historic issue that has impacted the lives of many, and has polarised the discourse on international peace and security. Any attempt to understand the rationale behind what is essentially a case of blatant violation of fundamental human rights is faced with accusations of anti-Semitism, a weapon used to silence voices calling for justice in the Middle East. I am convinced that the possibility of having a just peace is today far from realization because of the hermetic medieval siege imposed on more than 2 million already impoverished people in Gaza, and the slicing of the already sliced West Bank. The impossibility of realizing the national dream of one third of the Palestinian people has brought forward the embarrassing question about the rights of the remaining two thirds, namely the dispossessed refugees living in miserable camps in other countries and the second-class citizens of the state of Israel. What is the Palestinian cause if not the right of return of the refugees? We never tire of asking the question raised by the Nakba generation, the generation that was supposed to die, while we are supposed to forget: What is the Palestinian cause if not the right of return of the refugees, those inside and outside Palestine? Can genuine peace be achieved without resolving this? We live in a world that promotes democratic systems of government. It is supposed to be a system that brings about political stability within a state, guarantees equality of citizenship and individual freedoms. Nevertheless, the basic tenet of this system of majority rule are tested in multi-racial, multi-religious, multi-ethnic and multi-cultural societies. There is an inherent contradiction between advocating democracy as a universal idea, while defining the State of Israel in mono-ethnic terms. This approach has only resulted in the relegation of Palestinians residing within the state of Israel to the status of second class citizens. This undermines, inter alia, the very principle of equal citizenship which is at the core of a democratic system of government. Zionism, is based on the idea of separation, rejection of difference, and ethno-religious supremacy; it is based on a dogma that proclaims that Jews all over the world constitute one nation. In Zionist consciousness, we, native Palestinians, exactly like Native Americans, became a surplus population that must be gotten rid of. Those who remain would be considered a minority without political and national rights. We, native Palestinians, were viewed by hegemonic Zionism as an obstacle to realizing the Zionist dream by our mere existence and presence. This might explain the continuing ethnic cleansing in the West Bank, and the incremental genocide taking place in Gaza. Like any settler-colonial power, Zionism views native Palestinians as an ‘other’ (goy) to be fought against. The Palestinian resistance, peaceful or otherwise, is thus viewed as ‘criminal violence,’ ‘illegitimate,’ ‘terrorism’...etc. The realization of the Zionist dream has meant redemption for some Jews, at the expense of the native Palestinians who were dispossessed, and relegated to what Fredric Jameson, in another context calls, 'the political unconscious'. Thus, from the Palestinian perspective, the crystallization of the Zionist dream has meant dispossession and Ghurba (exile). Zionism wanted us to be forgotten forever in the ‘political unconscious.’ However, massacres, humiliation, dispossession, defeat, expropriation, invasion, denial of existence, and now a medieval, hermetic siege... etc, have not led to our ‘disappearance’. We have been robbed of our land, deprived of our identity and history; even our future has been stolen. The Zionist response to these atrocities is that the Palestinians should not have existed in the first place. We must remain invisible! Israel’s “independence” has meant a disaster for the Palestinians who have become the victims of the victims. The goal of Zionism has always been to make us invisible, faceless and voiceless refugees from nowhere, removed from the world’s active consciousness. We had ‘no history,’ ‘no consciousness,’ ‘no culture’ and thus no story to tell. We, Palestinians are ‘native aliens’, who became foreigners by the misfortune of being born to non-Jewish mothers. It is always frustrating that so many activists have no clue about the basics of the Palestinian question. I am always surprised to find myself explaining how, contrary to what has been central in modern liberal thinking; the idea of the citizen in Israel is totally missing. Israel is a state where citizenship and nationality are two separate, independent concepts. In other words, Israel is not the state of its citizens, but the state of the Jewish people. Moreover, Israel does not have a constitution. Further, since Judaism is a religion and since it is the basis of the existence of a “modern State,” why can Islam, Christianity or Hinduism not be so? Many of us think that the only solution to bring this horror, caused by a settler-colonial project implanted in the heart of the Arab World, to an end is only through democratic means by de-Zionizing the state of Israel and transforming it into a state for all of its citizens regardless of race, religion, ethnicity or gender. There are 7 million refugees waiting for that moment, and 2 million of them have already started their long march to freedom along the Gaza eastern and northern fences separating them from the towns and villages from which they were forcefully expelled in 1948. Alas, my parents are not among those marchers, but I am.